These fish can be caught all year round from 10 to 100 feet of water. 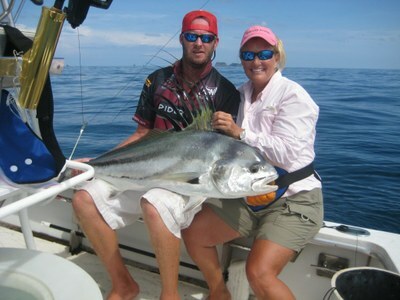 Rooster fish like big rock ledges and strong currents for chasing and ambushing there prey. One of the reasons people come from all over the world is that Rooster fish are only found on the pacific seaboard from Baja California to South America. 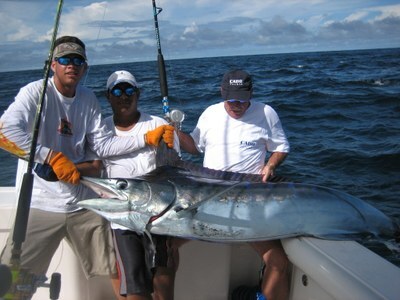 The way they fight is another attraction that brings anglers new and experienced to this water of Costa Rica and to my area of Flamingo, Costa Rica. Rooster fish can be caught in sizes everywhere from 10 to over 100lbs on light spinning gear, trolling, or even to test your skills fly fishing for these monsters! The monster of the deep a favorite for Mr. Trigger and crew truly are the big game test of the sea. With three different kinds in the area Black, Blue and Striped Marlin lurking in the depths off Flamingo Costa Rica any one can be a line ripping experience for any angler. Caught all year long be best when the bait is closer to shore in the months of November – February. These fish are mostly caught on live bait, trolling lures, or frozen cut bait. Growing well over 1000 pounds the Blue and Black Marlin are the Gods of the sport fishing. Their cousin the Striped grow to around 300 pounds and can jump 10 to 20 times when hooked up. Some favorite foods for these predators are bonito, dorado, small tuna, mackerel, and even mullet. A magnificent fish of the sea and a true test of skill, will, and power to any angler. 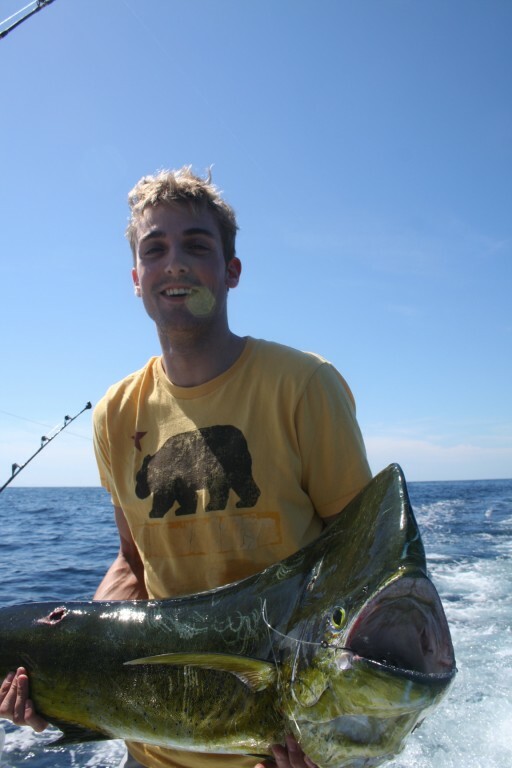 These fish can be caught all year around offshore even sometimes near shore in under 100 feet of water. The main reason for the popularity for these fish is the number of hookups in a day 5-20 and the size of these fish. In most areas of the world you are catch these fish but they are in the 30 to 80 pound rang here they are in the 70 to 150 pound range. So with the abundance and size of these fish it is easy to say Flamingo, Costa Rica is a place to go for these huge Sailfish. Eating mostly smaller baits on the surface like ballyhoo, sardines, and squid they are fun to catch on light tackle for many anglers. Wahoo congregate here in the rainy months from September – November because of all the debris and giant logs in the water. These fish are a great catch for the angler and the grill! With burst of speed up to 70 mph they are great fight for the first 30 min dumping a spool of line in seconds on the best of anglers. 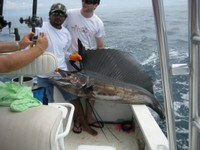 In the area of Flamingo, Costa Rica they are caught everywhere from 20 to 100 lbs. The smaller Wahoo are caught around islands and structure, as there older counterparts are off shore near ledges and current breaks from 200 to 2000 feet of water. Best months are May to the end of October; during rainy season when the rivers are flooding it attracts numerous kinds of bait fish like ballyhoo, sardines, needle fish, and herring to the mouths. These are all favorites of the Dorado. Although they can be caught all year around this is the best time to try your luck for one of these rod bending great eating fish. Growing anywhere from 10 lbs to over 50 lbs they are found offshore and even caught in kayaks near the shore by lots of local anglers. This is a great fish all over the world being the most popular for sushi and one of the best fighters of all of Costa Rica has to offer besides the Marlin. Growing to sizes up to 400 lbs these fish do not get any bigger anywhere else in the world. 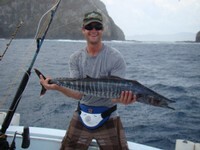 Feeding on Ballyhoo and other fast moving fish they are a blast on heavy and light tackle. Another reason they are so popular is there is so much meat on a single fish. Over half of the weight might be meat to take home and very little bones to deal with.